Though carpenter ants are among the largest ants found in Michigan, they are sneaky and rarely seen. Often confused with termites because they chew through wood (termites actually eat wood) to develop tunnels and nesting systems, carpenter ants can cause costly damage to your home or business. Because they tend to live inside walls, they can be difficult to locate and require professional treatment to fully eradicate. Buckmaster Pest Control has the needed industry knowledge and experience to eliminate existing carpenter ants, address points of entry, and deliver treatment that penetrates and destroys unseen nests hidden in your walls to prevent future infestations. Given enough time, carpenter ants can cause extensive and costly damage to your home and business. By chewing through wood to create tunnels and nesting areas they can weaken the structural integrity of any wood frame building. In fact, insurance industry reports suggest that carpenter ants cause as much structural damage annually as natural disasters. 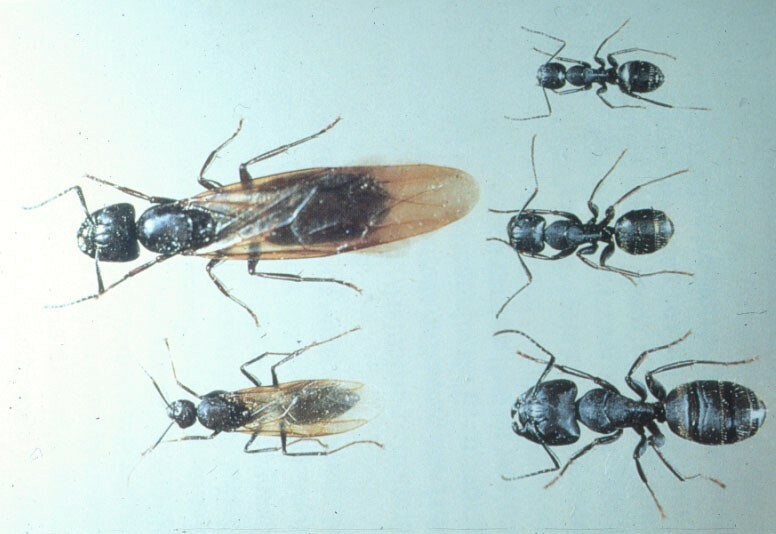 Swarmers (winged carpenter ants) – these leave the colony from late winter through spring to mate and begin new colonies. Spotting several of these in your home may indicate a colony nearby. Wall Noise – crunching/scratching/rustling sounds emanating from walls or ceilings could indicate a large nest housed in interior wood structures. Sawdust – small piles of coarse sawdust (known as frass) are an indication of tunneling activity. Damaged/Grooved wood – tunneling creates “galleries” in wood; these have a clean, sandpapered appearance.